Fall is the time of the squash. 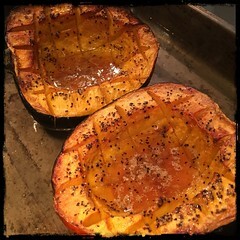 This simple recipe can be used with many different fall squashes. We recommend the acorn, buttercup or the butternut squash. Don’t forget to save the seeds and roast them with a spice blend of your choice, we like Zio’s Smoky spice blend (add some salt). 2. Wash and cut the acorn in half lengthwise from stem to tip. Scoop out the seeds and the stringy membrane. Score the flesh with 1-inch cuts. 4. Bake for about an 1 hour or until flesh is is soft and the edges browning.